With lyrics that touch the heart, move your soul,and inspire a new way of living, Let It Shine, contemporary music – smooth jazz, R&B, gospel & world beat – with a positive message. Vocals are by a number of soulful and powerful singers including Fulton Tashombe and Kelley Covington. 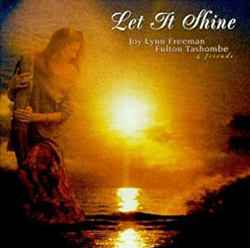 Lyrics are by Joy Lynn Freeman and support themes that are addressed in the book Express Yourself. Fulton Tashombe has been a professional musician for over 20 years for Motown and independently as a pianist, vocalist, composer, conductor and arranger. He currently has his own album on Mo-Jazz, Motown’s jazz label. He has also performed with such famed recording artists as The Whispers, The O’Jays, Johnnie Guitar Watson, Emile Richards and others. He has worked with or had his musical expertise incorporated on numerous recordings, including those of Natalie Cole, MC Hammer, Quincy Jones, Felton Pilot, and many others. Fulton works with a wide range of musical forms including jazz, soul, R&B, gospel, pop, and reggae, as well as original material. Beautiful Vocal Blending and Harmonies with simple backgrounds, to songs that will lift your spirit, touch your heart and remind you of the peace, wisdom and creativity that resides within. Song themes go with the books Express Yourself and 7 Keys to Connection by Joy Lynn Freeman. 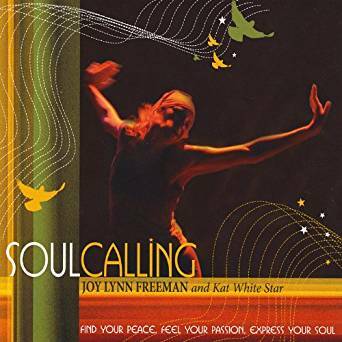 With beautiful harmonies between Joy and Kat White Star, these songs both inspire and create a feeling of peacefulness – as reported by many. The music back ground is simple and even includes a few acapella songs (vocals only) so that the voices and lyrics can be heard and felt. The earth needs to be honored as the beautiful mother that she is. We tend to be so afraid of moving within the unknown, but it is the unknown that is the magical precursor to all that is fresh, new, exciting and wonderful. Learning the art of surrender opens up new and wonderful vistas of life. Sometimes I have to remind myself to let go and surrender to allow for the magic to occur. There are times we listen to all the negative voices outside and with in us and let that stop us from going for new things. But it is just for us to remind ourselves that we truly are free to take Risks. We find ourselves in the process. Under all the crazies, a deep well of harmony exists for us to access whenever we choose. Learning to feel, accept and honor our deeper feelings, both past and day-to-day is a huge key to more vitality, aliveness and a living a life of Soul. Rather than being the half dead, depressed, compliant robot our culture would love us to be. Making mistakes is an important component of moving forward to new ground. If you are adverse to mistakes or give yourself a hard time for them there will not be the space for positive change to occur. We all have creative gifts that are unique to us. Take a chance, don’t worry about how “good” you are or are not. Just try some things or you will never know what lies waiting for you inside, that can bring you so much joy and fulfillment. The power and light that is the truth of who we are becomes more visible the more authentic we let ourselves be. If you listen to the still small voice you will hear the voice of soul calling…. Calling you to follow your heart, live a life of soul and do what you are here to do. The themes of the songs represent an earth based, soulcentric form of spirituality. Spirituality – that sphere of experience that lies beyond the limited world of our everyday lives and that opens our awareness to the ultimate and core realities of existence. There are two realms of spirituality: those of soul and spirit. They are distinct and complementary. Together they form a whole. Either alone is incomplete. Here I describe both realms, though this CD is mainly about the path to Soul. The vital and mysterious core of our individual selves, an essence that is unique to each person; the core and enduring qualities that define the essence of our personhood, the “real me”, the “true self”; that which is most wild within us and most natural about us. Soul is found in layers of the self much deeper than personality – Our core humanness. The soul speaks to us in images and feelings (visual, auditory, or kinesthetic), in symbols, and in metaphors — for example, through dreams, visions, revelations, poetry and music. Following our inner callings leads us to live a life of soul, one in which we can share our natural gifts with the world. the great and eternal mystery that permeates and animates everything in the universe and yet transcends all: God, Allah, Buddha, Christ, Great Mystery, the Absolute, the Divine, the Tao, the One. What all people, all things, have in common—our shared membership in a single cosmos, each of us a facet or part of the One Being that contains all. Spirit both transcends all things and is immanent in all things. Ultimately, each soul exists as an agent for spirit and thus both sides of the path are important. This way of honoring both sides has been practiced in indigenous cultures for centuries.